The 344th Bomb Group of the Ninth Air Force was a medium bomber unit that took part in the tactical bombing of the European Theater. Originally stationed at Stanstead, England, the unit moved to Station A-59 Cormeilles-en Vexin, France on 30 September 1944. Cormeilles-en Vexin is located about 40 kilometers northwest of Paris. As the Allies advanced, the unit moved again on 5 April 1945 to Station A-78 Florennes, Belgium. 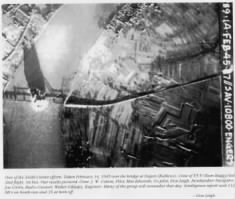 During early 1945 the missions for the bomb groups were German rail marshaling yards and V-1 rocket launch sites in France. Captain Thomas Gough Brennan, Jr. and his five crew members were training as a replacement crew at Lake Charles, LA. 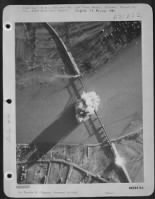 The photo was taken on 11 October 1944. Standing l to r: Pilot – Capt. Tom Brennan; Co-pilot – Fred LaFountaine, Jr.; Bombardier – Harry Zuest. Knelling l to r: Engineer gunner – Eddie Monahan; Radio gunner – Roy Pace; Armorer gunner – Willard Delavan. Brennan and his crew were the third crew to fly the B-26B 50, serial number 42-95917, nicknamed “Shopworn Angel.” They were assigned to the 495th Bomb Squadron. “Shopworn Angel” had previously suffered a crash landing as shown below. The 495th Bomb Squadron, also known as the Silver Streaks because of the distinctive aircraft markings, was tasked with the bombing on Valentine’s Day 14 February 1945. The mission that day was to be the railroad bridge crossing the Rhine River at Engers, Germany. Five aircraft were shot down that day and a total of 31 airmen were listed as either missing or killed in action. Captain Thomas Gough Brennan, Jr. (O-793050) was the pilot for the six man crew of the B-26. At approximately 1632 hours and just minutes before reaching the target, “Shopworn Angel” and the crew suffered a direct hit from German flak. The aircraft was at 11,000 feet when anti-aircraft flak hit the plane and caused a fire to break out in the bomb bay. Several gunners were wounded and Capt. Brennan shouted “Bail Out!” to the crew. Co-pilot Frederick LaFontaine, Jr. and bombardier Harry W. Zuest bailed out. Eyewitnesses saw two parachutes drift away as the aircraft went into a spin, making a left turn off the target. Pilot Brennan was able to gain control of the aircraft and crash land in farm fields 1½ kilometers southwest of Kruft, Germany. LaFontaine and Zuest were captured by civilians and hung to death. Buried in a local community cemetery, the bodies were later interred in the Margraten Cemetery in Holland. Sgt. Edward J. Monahan, the engineer, was killed in the crash. The remaining crew of three were slightly wounded and attempted to evade capture. However, Brennan was captured, put into the back of a truck with a noose around his neck. The aging truck was coal fired because of lack of gasoline and would not start. A Luftwaffe officer happened along and saved Brennan’s life from the angry mob. Sgt. Willard Alexander Delavan managed to evade capture until the afternoon of the next day. He was finally caught at about 1600 hours in the neighboring village of Ochendung, Germany. Missing Air Crew Report 12344 was filed when the aircraft failed to return to base.